Asian elephants (Elephas maximus) spend much more time in forests, where big ears to cool off are not only less critical, but could be a hindrance when trying to walk among the tree branches. So how does their two-humped forehead help them in their relatively wetter and cooler surroundings? And what about their skin? African elephants have looser, more wrinkly skin. Is that another adaptation to thriving in hotter, drier environments? Note the large ears, which come up higher than her neck, and straight back of the African elephant. She must be hungry too, and note the rounded lower lip). Note the tiny, lower ears, rounded back, tapered lower lip, and those rounded humps on top of the head of the Asian elephant. The Asian elephant's head is the highest part of the animal, as she holds her head at a 45 degree angle to the neck, whereas African ellies have necks that are held nearly horizontally. 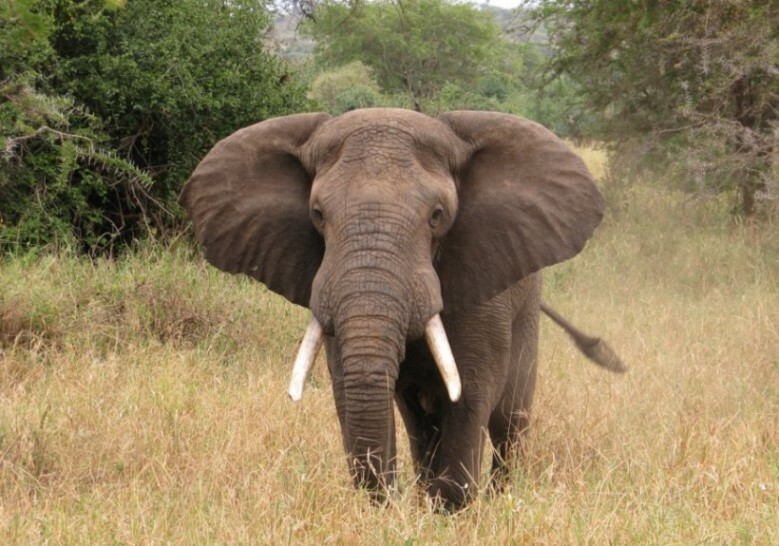 The jaw (particularly the upper jaw) in African elephants, especially bulls, is larger and more pronounced, to accommodate the development of their immense tusks. Those are the same tusks that encourage people to kill them to make jewelry and other unnecessary decorations. 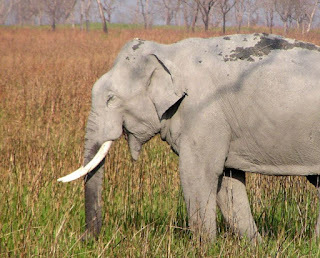 The jaw and trunk are adapted to hold up those large, heavy tusks. Most African elephants, of both sexes, have tusks, whereas most female Asian elephants do not have them. Tusks are large incisor teeth that grow throughout the animal's life, at roughly 15-18 cm per year. They don't fall out, so ivory comes primarily from elephants that have been killed for it (and and around one quarter of the tusk remains inside its socket, which is why poachers carve it out to remove it). So please don't ever buy ivory. Save an elephant and make your money work for them, not against them! And what about those trunks? All elephants use their trunks to smell, and their sense of smell is outstanding. Trunks are actually a combination of nose and upper lip, as well as, of course, a great grabber of food and other items. 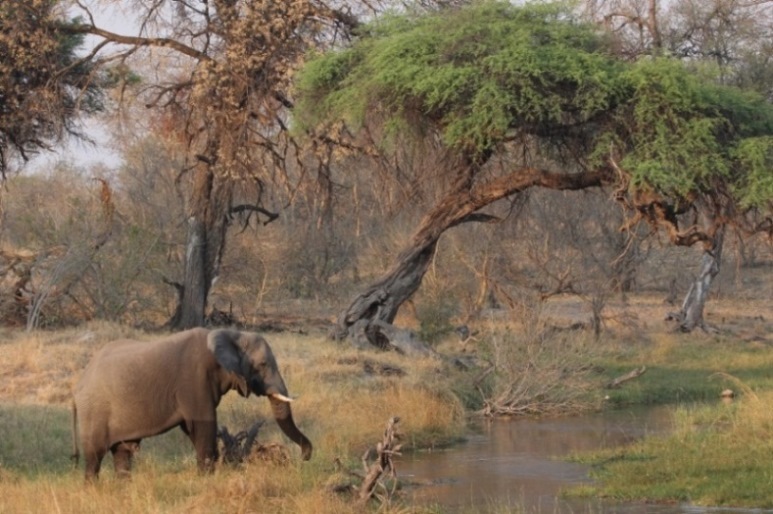 I have watched elephants in a Botswana research camp pick up up small fruits (1-2 cm across), one at a time, with ease. The fruits were sweet, so perhaps it resembled people picking up Tic-Tacs or other mini-candies. African elephants have two lobes, or fingers, on the end of their trunks, similar to our opposable thumb! for picking up anything from twigs to logs, and fruits on the ground to leaves in a tree. 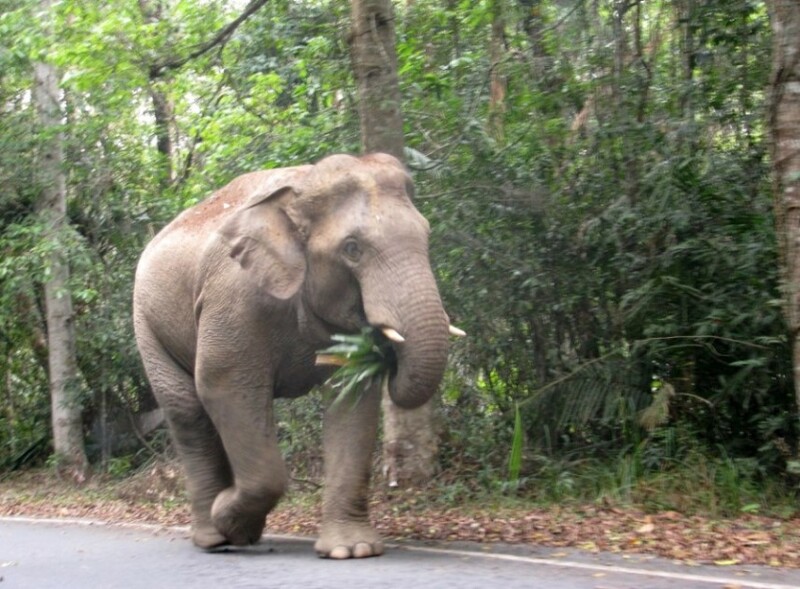 Asian elephants have just a single lobe at the tip of their trunks, so I wonder if they are able to pick up small bits of food with the same ease. While African ellies can directly grasp leaves, fruits, and grasses before bringing them to its mouth, their Asian cousins use their single finger to curl around food, which they then squeeze up into their mouths. 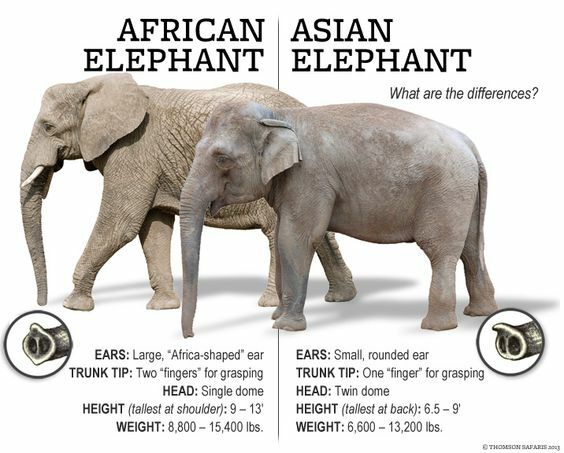 Based on those trunk tip shapes, here are their grabbing adaptations -- makes sense! So, based on all this, can you tell which species this is on the left? And on the right? The key to watching any elephants is respect. They are all huge. 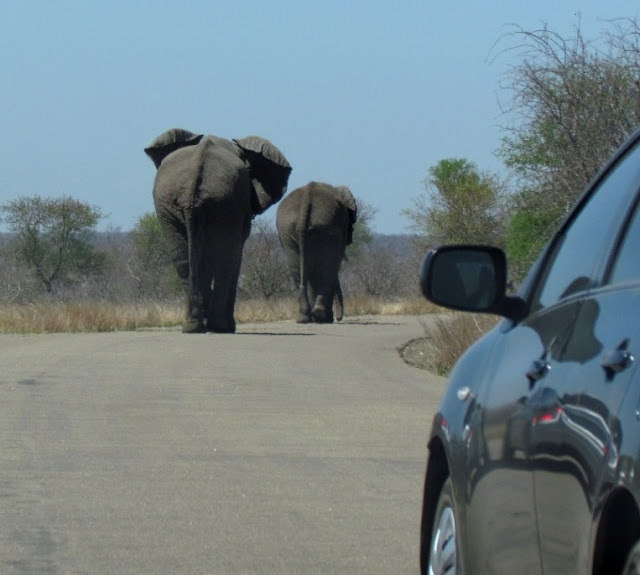 And they own the road, regardless of species! Nice post about elephant species! I completely read Mark Hutchinson this post and my favorite topic in this post the skin difference of Asian and African elephant.Excellent work! Thanks. 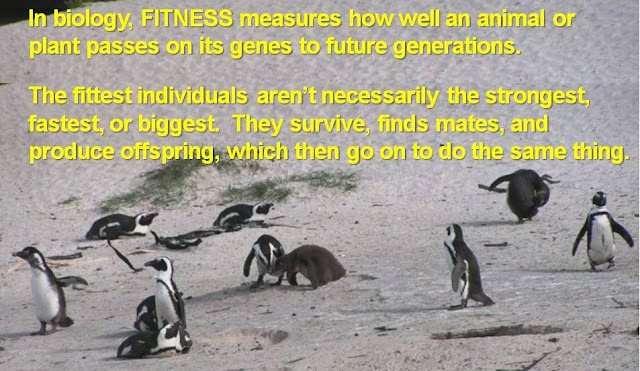 Thanks, John - both species are awesome in my opinion!